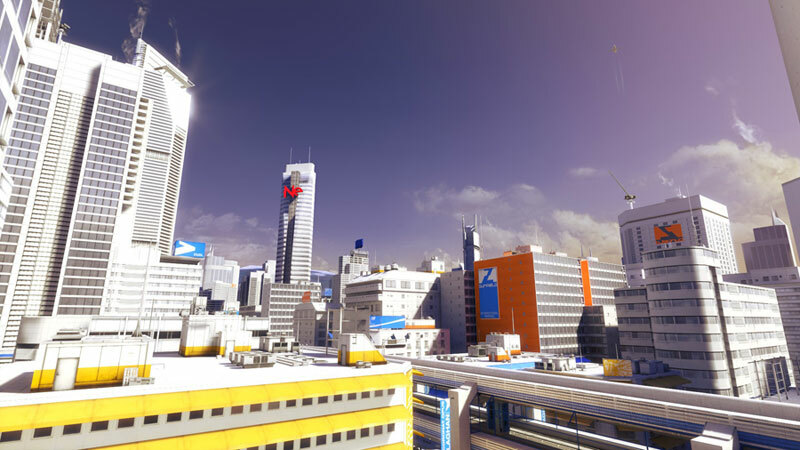 I had somehow missed most of the other reviews out there regarding Mirror’s Edge, so when I booted the game up I was a blank canvas upon which the designers could paint a visually-striking first-person platformer that worked (far better than others, anyway). And while I have seen those other reviews in the time after having completed this game, their legitimate criticisms does not change my mind regarding badly wanting Mirror’s Edge 2. It is difficult to say much more than “first-person platformer” because that pretty much sums up Mirror’s gameplay. You control a Runner named Faith, as she delivers packages and unravels a conspiracy in the unnamed City sometime in the (not so distant?) future. Most of your time is leaping from rooftop to rooftop, vaulting over AC units, scrambling over fences, busting down doors, shimmying up or down pipes, and basically making a circuitous path from Red Point A to Red Point B. Pretty soon, helicopter gunships and trigger-happy police officers are firing on you as you maintain an addicting sort of manic momentum and leaps of faith. Perhaps ironically, I felt more like a ninja in Mirror’s Edge than I ever did in Assassin’s Creed, despite this game being more realistic in terms of your ability to take falls and so on. Unfortunately, the reviews are correct in criticizing the game’s split personality when it comes to combat. While you have the choice early on to simply run around the police you encounter, by mid-game you are frequently required to take on armed guards with your relatively ineffectual unarmed attacks. There is a disarming method that will take out a guard in a single button press, but the timing is so ludicrously short – even with your recharging slow-mo ability – that most times you are better off flailing at the guards until you or they go down. Once the first guy drops, you can pick up his gun and take out the others with however many bullets are left in the clip. Ultimately though, when Mirror’s Edge is good, it’s great. Much like Portal 2, you will end up surprising yourself with the solution of “how the hell am I going to get over there?” – and managing to get a few stages correct the first time left me with a metaphorical runner’s high. Other times you will get stuck, shot, or take a flying leap off a building only to realize that wasn’t what the game wanted you to do. If you can accept the (minor) frustrations as the price of admission though, I highly recommend checking out the show. Amazing visuals for a 2-man indie game. Originally, I pooh-poohed SPAZ based on the demo not being not particularly impressive. Having acquired the full game as part of an indie game deal, I decided to give the game proper another shot. And what I discovered, 38 hours later, is both a deeper, more impressive game… and one sorely in need of a larger-than-two-developer crew. The basic structure of the game is destroying other spaceships, reverse-engineering their designs so you can build them, collecting Rez to build said spaceships, and basically having around seven different excuses missions to destroy said spaceships. 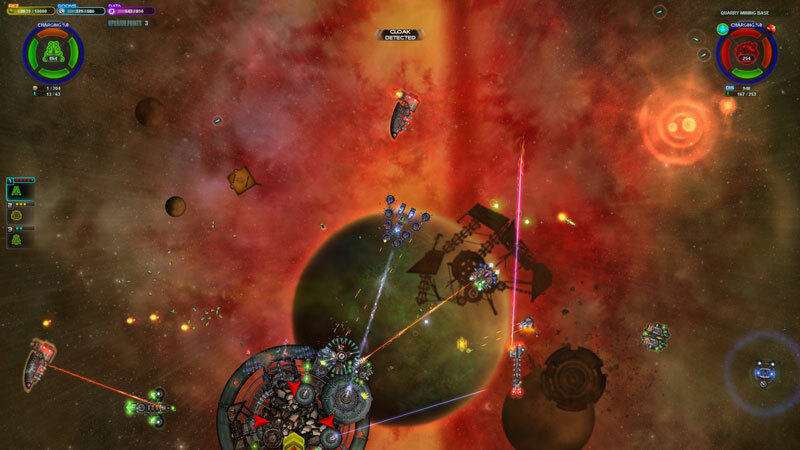 In many ways, SPAZ is sort of like Gratuitous Space Battles aside from being able to control the ships flying around. The underlying problem with the setup though, doesn’t creep up until around hour 10-15: pacing. The early game is extremely exciting with each new encounter resulting in new ships to pilot, there being many new components/weapons to try out, and so on. Unfortunately, the game becomes considerably less fun when you are piloting the same exact ship you were dozens of hours ago. Then, when you finally get towards the endgame and unlock those capital ship designs, the game’s difficulty evaporates as you steamroll them with a clearly overpowered design. I defeated the last boss in literally 20 seconds of holding the left mouse button down while stationary. Overall, it’s tough to be too critical though, especially considering the game held my attention for 38 hours. There is a lot to like about the things SPAZ accomplishes well, and rather than being disappointed with some of its failings, I simply wish MinMax Games had the additional resources to polish up on its potential.